PanARMENIAN.Net - Baku's attempts to conceal the number of fighters killed in the course of clashes between Karabakh and Azerbaijan since April 2 proved ineffective. Azerbaijan's official data suggests the death of 31 soldiers. The Berlin-based Caspian Defense Studies Institute, however, has identified 93 killed fighters, including 21 officers, 10 sub-officers, and 10 contract servicemen. Besides, 33 soldiers have been wounded so far (no information on the wounded was provided by Azerbaijan). As of April 5, the Azerbaijani side has lost 26 tanks and 4 infantry fighting vehicles, as well as 1 BM-21 Grad multiple rocket launcher, 1 engineering vehicle, 2 military helicopters and 14 unmanned aerial vehicles. 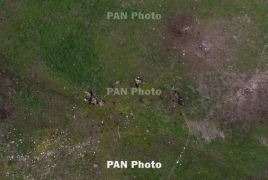 The Azerbaijani side has admitted the loss of 31 fighters, 1 helicopter and 1 unmanned drone, whereas the Armenian side's photo and video materials show dozens of killed Azerbaijani troops, 1 helicopter and 3 UAVs. Opposition media outlets, however, reported on the death of 93 Azerbaijani soldiers, stating that 33 more have been wounded. According to Karabakh authorities, 300 Azerbaijani soldiers were killed in clashes.